Have you ever considered clay? It comes from the humblest of places, riverbanks, and in most cases, it is out of order. It sticks to your shoes, stains everything, can’t be used for growing plants, kind of smells, and is generally of no use anywhere but around water. Yet, when we heat up clay something amazing happens: it hardens. Duh AJ, we know that! I know you do, but do you know why it hardens? Clay molecules are chaotic, they are all over the place. The reason you can push clay into different forms and mold them into any shape is that that matrix of chaos has strength enough to hold together, but is not strong enough to resist force. So you can push and pull and smash and mush and roll it and it will still be clay, just in a different form. Once the water leaves though, clay is no longer malleable, shapeable, and is instead stuck in whatever place it was last left. Water makes clay just viscous enough to be molded, but it has no ability to transform clay in and of itself. Water is just a vehicle for the process. So what does the actual transforming? Well, you know the answer already! Get to the point, AJ! It’s fire, of course. Fire stresses out the molecules of clay. The heat makes all of those little chaotic molecules, the shards, that are running around all over the place suddenly change and line up. They straighten and all point in the same direction and suddenly a shape that could be pushed and formed is rigid and fights back. This chaos, once placed in order, becomes the strength that is able to withstand great force. Humble clay has gone from being unwanted, dirty, useless, muck to a pot that holds water or a dish that holds food. It is suddenly important, useful, and beautiful to whoever owns it. Once you apply glazes and all the other fun pottery stuff, the finished piece of pottery looks nothing like what it came from. It has transformed, in the truest sense of the word, and for anyone who has ever worked with the process, is practically magic. All of that is because of fire. Fire is stress. Fire is pain. Fire is destruction. It is no coincidence that the phrases “trial by fire” and “forged in fire” have become common vernacular. We know instinctually that the things that cause us the most pain can also make us better people. I feel that we often forget though that the process changes the person just like how the clay is changed. You simply cannot expect to go through flames and be left without burns. I’m leaving that up to you. Do you see yourself as clay that has been through a fire, lined up your molecules, and are now stronger because of it? Or do you see yourself as clay robbed of water, drained of energy, and fragile to the touch? Do you find yourself stronger than you were before, yet unrecognizable to the people who used to know you as clay? Do you feel frustrated that they no longer treat you the same way? Are you scared of what is to come, or are you waiting for what you may be? As for myself, well, you know how crazy my career is. I just finished a major commission, am enjoying the feedback on “The Book That Shouldn’t Exist”, and facing my own fire by trying to get spots in bookstores (spoiler alert, they don’t want me, lol.) I’ve also put Nuts 3 on temporary hold in order to remake a book that I delisted a long time ago. It was my second book and it lingers in my head, demanding to be remade. I’ll share more on that soon. For now, though, have a wonderful weekend and remember that no matter what trial you face, if you face it well, you will only become stronger. It’s been a couple of weeks and I’m sorry for not emailing sooner. The simple explanation is that a lot of things have been going on both in my private world and in the greater scheme of things. Besides working on the new book, which has been difficult, I’ve also worked through a major life issue that I never knew I had been fighting. Fear is a difficult thing. It can sneak up on you and rob you of action. It can stop you from standing up for yourself, stop you from making money, and keep you in a relationship that’s bad for you. Fear is powerful because it’s an unanswered possibility. It’s not the dark that we fear, but what possibly could be hiding in the dark. To a person with high anxiety, fear can seep into every aspect of life. Maybe you stay silent when people are rude to you because you don’t want to cause a scene. Maybe co-workers and bosses pile work on you because you are afraid of losing your job. Maybe you don’t take that dream vacation because you are afraid of what could happen during the trip. It doesn’t matter what the situation is, fear itself will come up with an excuse as to why you shouldn’t do it. For me, the majority of my fear stems from my work. I’m afraid of what I want to make. I’m afraid of what will happen if I do make it and I’m also afraid of what will happen when I don’t make it. I have a Master’s in Screenwriting, but the fear of putting my work out there stopped me from entering the film industry. The fear of rejection led me to self-publish (a blessing) but that same fear also keeps me out of bookstores. Fear was supposed to protect us. It was supposed to stop us from going into the bear’s cave and remind us not to eat all of the food before winter. It’s there to help us, but unfortunately for many of us, it has become our master. If this is happening to you, then this is a call to take back control. Two months ago, shortly after the Parkland shootings, I sent an email asking permission from you if I could write a book that dealt with this terrible subject. Overwhelmingly, you responded with encouragement. For that reason, this new book exists. So in a way, this is your book as well. Second, I want you to recognize that fear is subservient to you. It is a warning light on your car that you are allowing to drive. Consider what it has to say, thank it for the warning, and press on with the decision you have made. You are in control of your life. Fear not what is out of your hands. So what about this book I was afraid of? Why would I fear to share it with the world? Well, we live in times where mobs of internet users can destroy people they disagree with overnight, so that is a concern, but not sharing my art is an even greater concern. What happens with this book is entirely up to you. If it helps, I hope it grows. If it’s not needed then so be it, there are more books on the way. At the very least, I’m no longer afraid of making it. 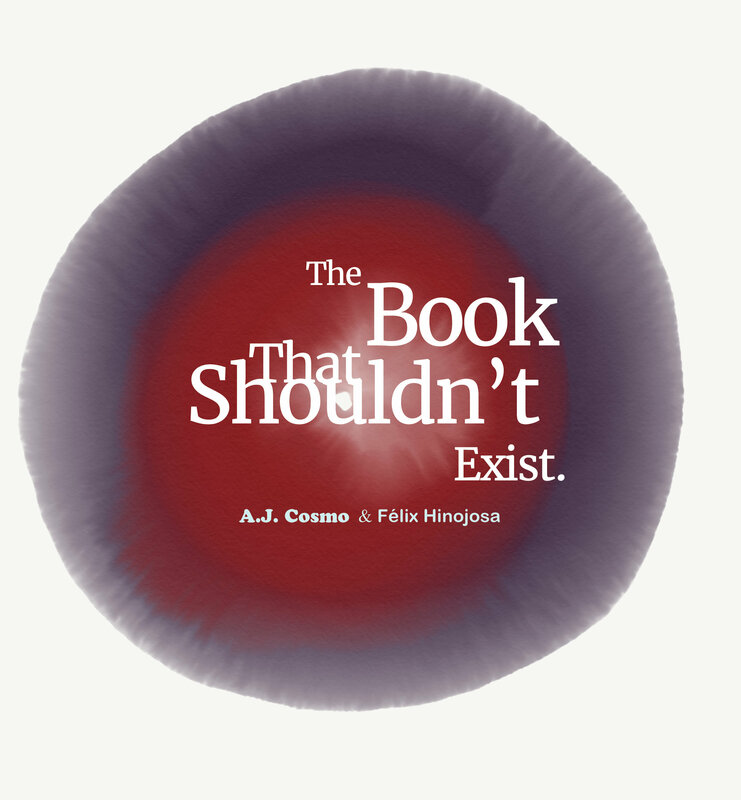 “The Book That Shouldn’t Exist” is now available for pre-order and will release on April 20th. Click here to reserve your copy. Author adminPosted on April 12, 2018 April 12, 2018 Categories books, commentaryTags a.j. cosmo, childrens books, commentary, writingLeave a comment on What’s There to Fear? The simple truth is that we cannot do an ounce of good in the world if we aren’t right within ourselves. For how could we love another if we hate ourselves? And to clarify, I’m speaking about self-worth, not self-glorification. No one in the world benefits when you worship yourself, especially you. Those who are familiar with my work know well where I fall on every issue in the headlines, however, my opinion doesn’t matter. What does matter is how you feel and what sort of an impact that feeling is having on your life? Are you making a positive impact? Or are you caught in a negative mire? You are the only one in your head, so hopefully, it’s a good experience. This isn’t to say that happy thoughts will fix all the world’s problems, but it’s a darn fine start, and I’d challenge anyone to point to a time where pessimism helped. Speaking of challenges, it’s back to school time and I’m delighted at the extra love that “I Don’t Want to Go to School” has received. I’m grateful for the support and delighted that so many teachers and parents have used it to calm school anxiety. Check out the print version here if you’d like a copy for someone you love.